I am a very impatient person. So much so that I am horrible about waiting to talk while having a conversation. I also have a tendency to watch a season of a show and then skip to the final episode (I blame Netflix and Hulu for this) or read the majority of a book and then skip a few pages (or 10) to get to the end faster. Part of the problem seems to be that my attention is less as I get older and partly that a lot of books and television just don't seem to be that great. I know that sounds harsh, but great books. movies etc. still can hold my interest, they just are very few and far between. I guess as I get older quality has become much more important and I don't have the patience to deal with okay or mediocre. Life is too short to spend a lot of time on something that isn't great. This recipe has 6 ingredients. It takes 1 hour and 10 minutes of total time, 25 minutes of which is active and makes 4 servings. I did make a number of changes to the original recipe. First, since I eat gluten free I used gluten free panko. I used a block of Gouda which I sliced into thin slices myself. As suggested by the magazine I used a rimmed baking sheet and increased the amount of horseradish mustard. Finally, I used bone-in chops and my total cooking time as 25 minutes. Make sure to pick fatty pork chops and spray the top of the chops with canola oil. This allows the chops to have a great crispy outside and tender inside. My family really enjoyed these chops. If you aren't a fan of Gouda other types of cheese would also work, especially sharp cheddar. The same thing goes for the Creole seasoning, if you don't like the heat you could use any other type of seasoning salt and it would work just as well. 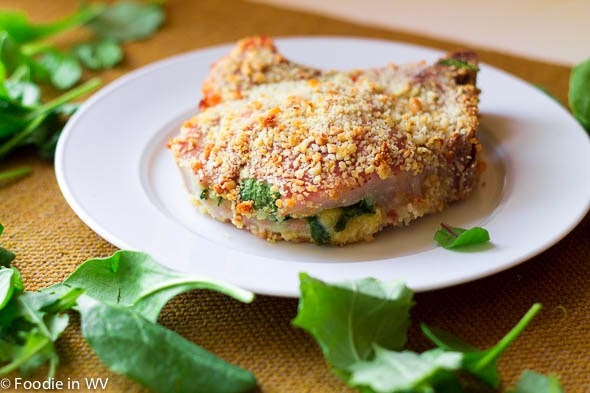 For the recipe go to Gouda and Spinach Stuffed Pork Chops. Mmmmm, love the combo of everything in this. I'd definitely go for that crispy outer crunch! I love gouda but have never eaten it warm or melted, now that I think about it. These sound really delicious. It's great warm, especially on sandwiches, yum! Hahaha, you sound SO much like me. I am one of the most impatient people ever. I don't read because I can't stand waiting for the good stuff and if I do watch a tv show, I don't watch it until the series has ended so I don't have to be stuck waiting on a cliff hanger! We are a lot alike :) I agreed on cliff hangers, I hate them! These sound amazing! I never can find good recipes of what to do with pork chops. I love spinach too. It's interesting. I can sit and read a book, but I get so bored watching T.V. and movie I have either want to watch something REALLY bad, or else I have to do something while I watch it. Usually I sew. I just don't have attention for them. Pork chops can be hard since they dry out so fast. This recipe is great since the chops are stuffed, they stay really moist! My success with stuffed porkchops hasn't been great (my fault, I'm sure). This one has me wanting to try again. 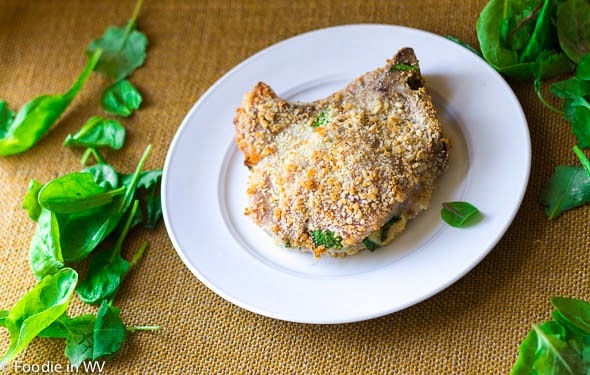 Stuffed pork chop recipes can be really hit or miss. This recipe was really good though, nice and moist with a crunchy outside! Gouda is one of my favorite cheeses and I loved how you stuffed it in a chop! I know my husband would love this recipe... thanks for sharing it! Gouda is one of my favorites too. It goes great with pork! I have to try this. I made a pork dish on another blog and it turned out great. Now, I have to try this recipe.